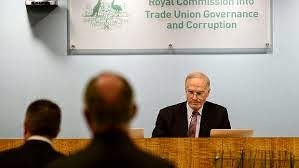 Today, the Royal Commission into Trade Union Governance and Corruption took evidence from Stephen Paul Donnelly, currently the assistant secretary of the Victorian branch of the Australian Labor Party. In 2009 Mr Donnelly was working for Senator David Feeney. David Feeney is named 6 times by Ms Gillard in the Record of Interview with MD Peter Gordon on 11 September, 1995. David Feeney was a central figure in Ms Gillard's claims that she paid for all her own renovations. Here are the 6 Feeney "grabs" from the record of interview, then I'll publish the whole of the section for context. The speaker is Ms Gillard, 11 September, 1995. David Feeney, who is an official of the Transport Workers' Union, had raised it with Andrew with the specific intent of Andrew raising it with me and David was happy for me to talk to him about it. I have spoken to David Feeney. I spoke to him on Friday afternoon. Obviously, it accords with what David Feeney has told me that he was sent away by the AWU and without explanation an account from Con was put in my letter box last week, so that's the first account that I've had from him. I'm making arrangements to get the $1780 together to pay the rest of it. I have suggested to David Feeney that I think the way forward in relation to this is for me to simply meet with Bob Smith at FIME and say someone came here looking for payment of an account. The information from David Feeney is that Bob Smith doesn't believe that I am at fault in relation to this. He has got no agenda about damaging me in relation to this or using it against me, that he will be quite happy to see the issue go away, and that he thinks that Bob will respond well to a direct discussion like that. I've left that matter on the basis that David Feeney will sound Bob out and, provided there isn't any unforeseen problem, I will meet with Bob as soon as possible for the purpose of clarifying that matter. Now I believe that that must be the source of the rumour about, that must be the factual construct behind what has become the rumour about, about the association or Bruce or the union or whoever paying for work on my house and I don't obviously given I've been fairly surprised by events to date in relation to this matter, I can't categorically rule out that something at my house didn't get paid for by the association or something at my house didn't get paid for by the union or whatever, I just, I don't feel confident saying I can categorically rule it out. So what events did Mr Donnelly reveal while he was working for Senator Feeney and therefore, presumably for us, the Australian taxpayers? Q. That was up in Queensland, wasn't it? Q. Who were you working for at that time? Q. Were you on leave for the month and a half or so that you were in Queensland? A. It followed the time that I worked on the Federa lelection campaign in which I'd accrued enough time in lieu that I was working on my own time under an arrangement with Senator Feeney. As far as this blog can ascertain, there was not a word in the Main Stream Media questioning whether Mr Feeney was campaigning for Union candidates while being paid by the public purse. As someone who knew George Brandis long before he entered the Senate, in fact going right back to high school or could have been earlier, I can assure you the opinion he expresses now is exactly the same as he had back in the 1980′s and 90′s.If anything he is more like that now than he has ever been. In a former life (not literally! ), we had many a meal and long discussions late at night where libertarian views were expanded upon at length. Then as now he came from the small “l” end of the liberal party membership spectrum and I always used to taunt him that he would end up a socialist if he didn't swerve a bit more towards small government and lowering taxes - not that he's a taxer by nature but he could be a bit cheeky! He was then as now one of the true intellectuals of the party. I hope that he continues to write and discuss political philosophy - you can see as much from his library which believe me and ignore the naysayers on this one is excellent in its depth and quality and is a public asset for all in the government and probably even the Opposition use it (if any of them could read which I doubt but George would let them - he's that sort of guy). Sadly much of our political media class only write from the perspective of the political left whether social policy or economics - not enough focus on tax and debt and too much on save the squirrel! On a different but not unrelated matter, many journalists have spent many column inches, sinking the metaphorical boot in Senator Brandis describing him as the "Bigot's Friend"!. Sadly this reflects badly not on Senator Brandis but on the writer himself. Fortunately for “George”, his relatively rapid rise from unknown university academic to media host and commentator to Attorney General, has not gone to his head. He demonstrates the callowness of youth is easily triumphed.. Very certain of the righteousness of his opinions, he is disdainful of alternate viewpoints and quite rightly so he should be!. Sadly I think it is unlikely that in the near term his thought processes will mature any further though once he locks in the bigotry bill he'll have time to take on other projects and lowering taxes is one of them! Abstraction is yet to replace the concrete thinking that infests his developing intellect. I live in hope that he one day he will stop thinking he is intellectually superior to those he interviews and commentates upon. I am not holding my breath because really he can be a frightful bore but then again mostly he is a genius. cant have it both ways I suppose.